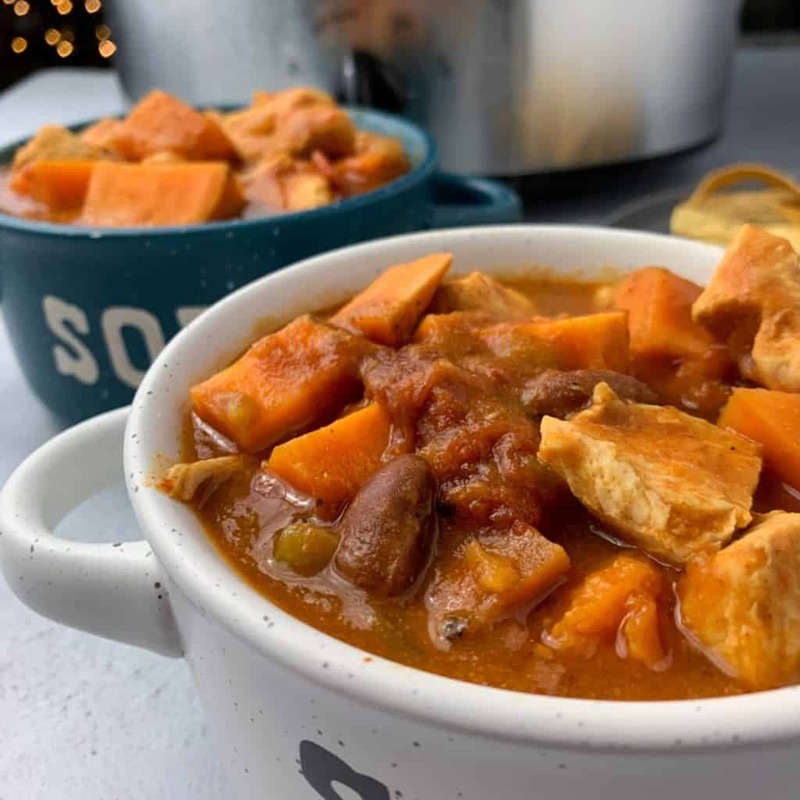 The chances are slim but if you’re in search of recipes high in vitamin A, this slow cooker sweet potato chili should end all searches. It’s loaded with beta carotene thanks to the obvious sweet potatoes and the not so obvious pumpkin. 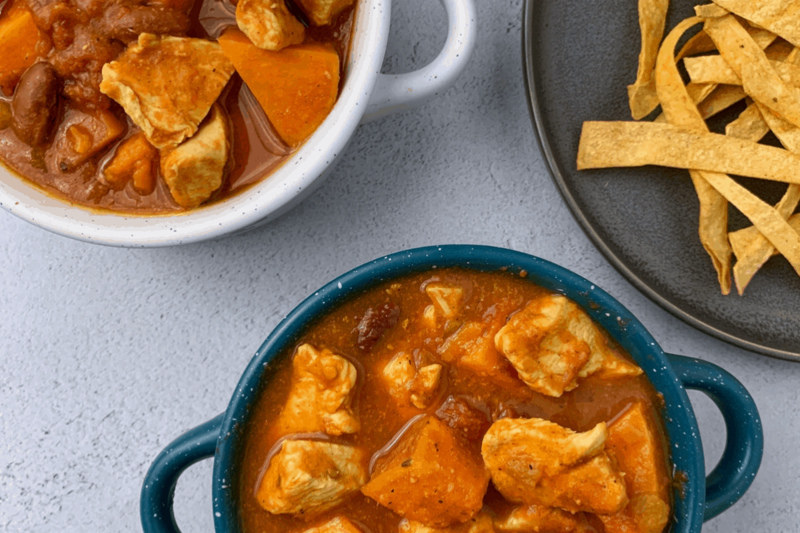 That’s right, this chipotle chicken chili is perfectly spicy, savory, and thanks to the pumpkin, thick and creamy. Like nearly all my recipes, this slow cooker chili is super easy to make. With a 5-10 minute prep time, you’ll have the chili cookin’ and kitchen cleaned in no time. As you can see, this sweet potato chili is extra macro friendly with only 260 calories per serving. And in case you’re wondering, one serving is a giant 1 1/4 cup or 350 grams. That’s a ton of food! Like I said, this chipotle chicken chili is crazy simple. Other than cubing the potatoes and chicken, you’ll only need to open cans and add spices to the crockpot. And you can even use pre chopped potatoes to cut down on prep work. The recipe calls for a handful of spices but if you’re a minimal cook with a minimal kitchen, you could get away with using a pre mixed chili seasoning. Though I’ll point out the combo I used is on the mild side. So, if you make changes, you might add half before cooking and season the rest after cooking as needed. I honestly don’t think you’ll need much. The chunks of sweet potato and beans provide a ton of texture in addition to the chicken. I did, however, make some tortilla strips like I used in my healthy Frito pie recipe. To make these, simply cut extra thin corn or flour tortillas into strips, spray with a bit of cooking spray and sprinkle with salt, and bake or air fry for 5-7 minutes at around 400 degrees. 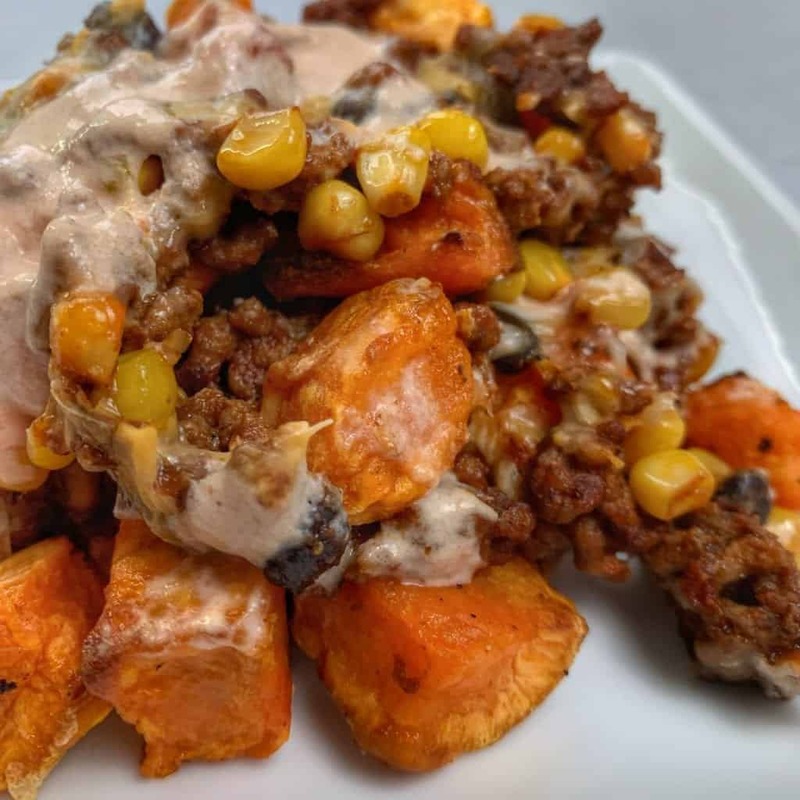 If you find the chipotle adds a bit more heat than you’d like to the chili, the cheese and yogurt (or comparable foods) work wonders for reducing the spice. The creamy salsa (salsa + Greek yogurt) I used to top my sweet potato nachos, for example, takes that dish from spicy to almost mild if used liberally. Sharing definitely helps my efforts as a blogger. 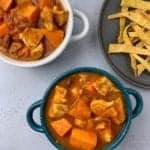 If you try this slow cooker sweet potato chili, I’d love to see it. Grab a photo and tag me on Instagram @mason_woodruff, join my free Facebook group and share it with the Proton Party, or click the Pinterest button to pin this recipe. I appreciate it and hope you enjoy! A high volume, low calorie slow cooker chili recipe. 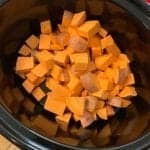 Wash and cube the sweet potatoes before adding the a crockpot. You can also use precut or frozen roasting sweet potatoes. 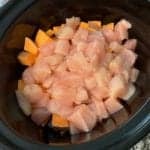 Cube the chicken and add it to the crockpot. Add the remaining ingredients to the crockpot and stir well. If you're using chipotle peppers in adobo instead of the chipotle salsa, run them through a food processor or blender before adding. Also, you may want to reduce the chili powder/black pepper and add a sprinkle or two of salt. Feel free to add/modify the spices in the recipe to fit your preference. If you like spicy, you may want to add more chili powder or a bit of paprika. My slow cooker chicken fajitas recipe is even easier to make than this sweet potato chili. 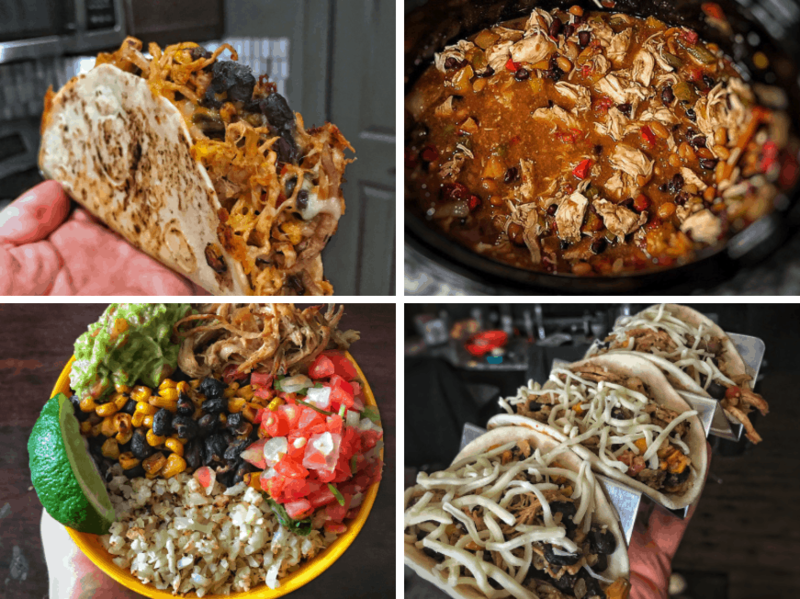 And I’ve included a ton of ideas for pairing like quesadillas, burrito bowls, and more. Take the total macros for a can of beans (or any ingredient you’re leaving out in the future) and divide that by the number of servings. Then subtract that from the current macros for the updated numbers. Enjoy! This chili was so easy and so delicious! Definitely a house favorite already. I didnt cube the chicken and chose to just shred it at the end, which worked well but needed a bit more time in the slow cooker. Also my slow cooker is half size, and this was SO MUCH FOOD I ended up making two batches… leftovers for days!! This is amazing! And I’m not a huge chili person! I also am in college and live in a dorm so this was super easy to make with my small crockpot! Eating healthy is my priority. Eating tasty is my husband’s priority. Eating picky is my kids priority. This was a win for all..I have a sensitive stomach for spicy so I last out green chilies. This was very good. A tad spicy so I drained it and laid it on buttered rice, for kids,with some cottage cheese. This overflowed in my crockpot but it was so worth it! I can’t get over how hearty and macro friendly this is. I am not one for hot things but this was the perfect amount of spice to give great flavor! I will def be making this again! 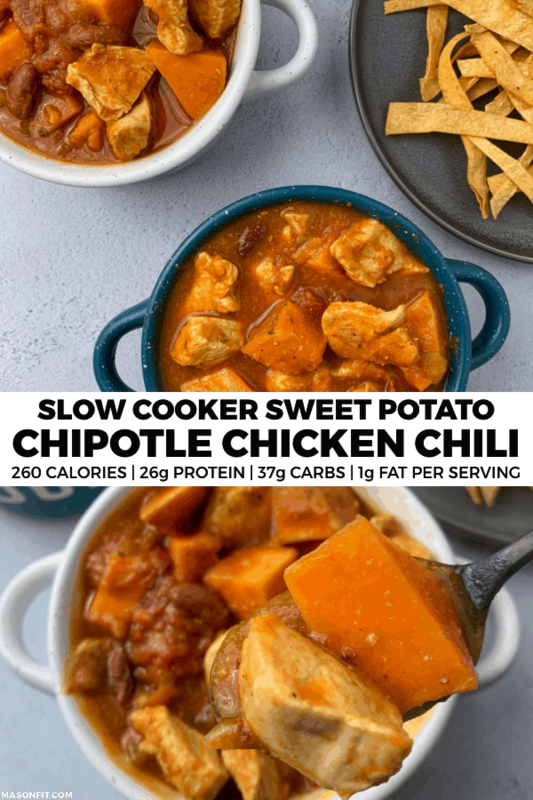 This slow cooker sweet potato chili recipe is in my regular rotation for meal prep. My mom usually thinks my healthy food is bland and she loved this recipe. Hi! This looks great but I am trying to import this directly into My Fit Pal for 10 servings and the numbers aren’t adding up. Thoughts? Thank you! Likely different ingredients. I always recommend logging the exact ingredients you’re using and only using my numbers as a general guide unless it’s one you can match the ingredients 100%. Made this for my meal prep meal of the week. I opted out the pumpkin (cause I am not a fan), but it came out good. Will definitely add this to my rotation.